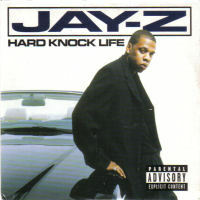 "Hard Knock Life (Ghetto Anthem)" is a single from rapper Jay-Z's third album Vol. 2... Hard Knock Life. It samples the song of the same name from the Broadway musical Annie. The song was produced by The 45 King and at the time of its release, was the most commercially successful Jay-Z single. The RIAA certified it as a gold single in March of 1999. In addition, it was nominated for Best Rap Solo Performance at the 41st Grammy Awards in 1999. It was ranked number 11 on VH1's 100 Greatest Songs of Hip Hop. 1. "Hard Knock Life (Ghetto Anthem) (Radio Edit)"
2. "Can't Knock The Hustle (Fools Paradise Remix)"
3. "Hard Knock Life (Ghetto Anthem) (Album Version)"